I used to subscribe to a magazine called Cook's Country. I loved reading about their cooking experiments, recipe makeovers, and equipment reviews. However, since I now eat gluten-free I can't use most of their recipes and no longer subscribe. One of my favorite recipes from Cook's Country is their Wacky Cake which is their take on a WWII-era cake made with no eggs or butter. What's 'wacky' about it is that you mix all the ingredients in the pan you use to bake it. No need to mess up a mixing bowl! Preheat oven to 350 degrees. Grease an 8"x8" pan. Whisk together dry ingredients in the pan. Make three craters in your flour mixture. 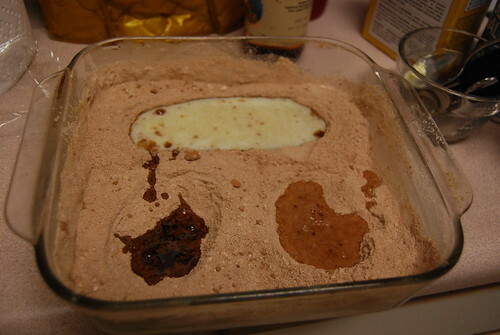 Pour the oil/butter, vinegar, and vanilla each in their own separate crater. Then pour the water over the top and mix it all together quickly. SO easy!! Who needs a cake mix? This cake is good cut into squares and eaten plain. I've also made a chocolate ganache to pour over it. 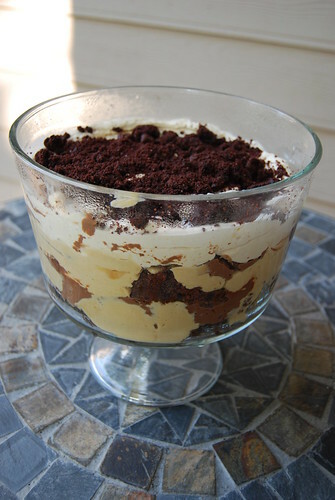 Today I used the cake to make a chocolate peanut butter trifle.